In order to cater the diversified needs of our clients, we are engaged towards providing a wide range ofStraight Condensing Steam Turbine. Our professionals manufacture this turbine by using well-tested material and leading techniques in accordance with the set standard. Offered turbine is used for power plants, cogeneration in industry & small process industry. Customers can easily avail this turbine from us at market rates in a given time frame. 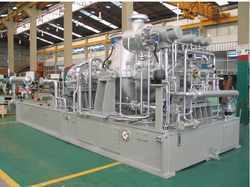 Looking for Straight Condensing Steam Turbine ?